Heritage layouts provide a great opportunity to play with collage effects. The following layout shows how you can create a gorgeous collage border with a handful of stickers and some scraps of paper. This layout was created using Marah Johnson Canvas Wash paper for the background, brown Paper Garden cardstock for the photo mats, scraps of Hot of the Press Lace paper and KI Sand Linen paper and Karen Foster Heritage stickers. 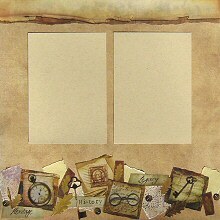 Creating the collage border along the bottom of the page is a lot easier than it may look. Begin by cutting out your Heritage stickers from the sticker sheet so you can easily play with their arrangement. You will also need scraps of heritage paper to fill out the collage. I used three rectangles of Hot of the Press Lace paper and three rectangles of KI Sand Linen paper. I tore the edges of these to add interest. Now all you have to do is play! Experiment with different arrangements until you are satisfied. I suggest you begin with the largest elements and work down to the smallest elements. The four large square stickers are the main focus of your display, so position them first. Next, place your paper rectangles around them. Slip the edges of the rectangles under the stickers so the stickers remain the focus. Your arrangement should now stretch from one side of the page to the other, with gaps. Fill in the gaps with your remaining stickers - titles, leaves, buttons and a key. When you are happy with your arrangement, stick everything down. That's the hard part done already! Now all you have to do is mat your photos, position them on your page and adhere your border sticker along the top of your page. And voila! You have created a great heritage page with a minimal amount of effort!